Earlier this week, the US National Oceanic and Atmospheric Administration published its – Global Summary Information – June 2015 – which reported that in the period January to June 2015, the globally-averaged land and sea surface temperatures were the highest for those months since the data was first collected in 1880 (135 years). I am not a climate change expert but the array of data that I have looked at from a statistical perspective tells me that what the experts are saying with respect to global warming and climate change is probably correct – it is happening and it is happening relatively quickly. The conservative Australian government remains in denial of the global trends with respect to climate change. It is introduced various policies that have made us a national disgrace – such as, abandoning the mining and cut taxes introduced by the previous government, defunding a research institute set up to provide information about climate change, and instructing a public ‘Green Bank’ to not fund wind or solar projects. This week, the government has been castigated by a British Tory MP, who said that its approach to climate change was not that of a ‘conservative government’ and bordered on delusion. But the most important piece of data this week has been the latest figures from China that show that dramatic restructuring away from coal consumption is rapidly taking place which will undermine the viability of the Australian coal sector in the coming decade. So the ‘market’ is going to force change in Australia when it would be much better for government to plan an orderly transition away from coal. … a departure from a reference value or long-term average. A positive anomaly indicates that the observed temperature was warmer than the reference value, while a negative anomaly indicates that the observed temperature was cooler than the reference value. These measures can be thought of as ‘normalising’ the data “so they can be compared and combined to more accurately represent temperature patterns with respect to what is normal for different places within a region”. The NOAA tell us that “Anomalies more accurately describe climate variability over larger areas than absolute temperatures do, and they give a frame of reference that allows more meaningful comparisons between locations and more accurate calculations of temperature trends”. Normalisation is a standard statistical tool to allow data from different scales or whatever to be compared. The following graph is very interesting from a data-watcher perspective. It comes from the NOAA’s – Global Analysis – June 2015 – and shows the anomalies in land and ocean temperatures since 1880. Anomalies are with respect to the 20th century average (1901-2000). A simple test for randomness of the pattern shown (a runs test, for example) easily rejects the null hypothesis that the pattern is random. In April 2015, the Pope of the Roman Catholic Church hosted a workshop in Rome – Protect the Earth, Dignify Humanity. The Moral Dimensions of Climate Change and Sustainable Humanity – which dealt with issues relating to climate change and human trafficking. Around 64 European mayors with other mayors from around the world were in attendance. The conference preceded and will inform the October 2015 United Nations Paris summit on global warming. Earlier this week, the Covenant of Mayors, which “is the mainstream European movement involving local and regional authorities, voluntarily committing to increasing energy efficiency and use of renewable energy sources on their territories”, released their own statement largely in line with the Final Declaration from the Vatican workshop. The calls were for a shift from “fossil fuels and toward renewable energy” to alleviate what the mayors clearly considered to be human-caused climate change. 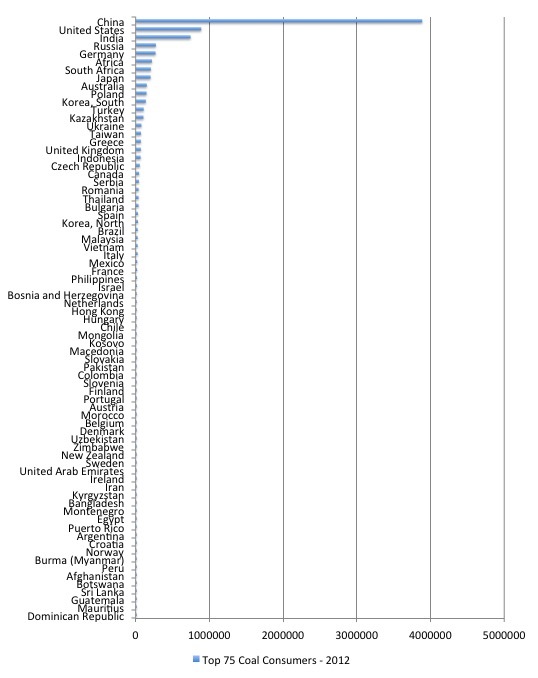 Our national government ranks as one of the outliers in the climate change policy agenda. Our so-called ‘conservative’ prime minister has been on the public record denying the issue. In his 2007 book – High and Dry: John Howard, Climate Change and the Selling of Australia’s Future – former speechwriter for the conservative Environment Minister, Guy Pearse accused the then Prime Minister John Howard of “wilfull blindness” when it came to the issue of global warming and produced a compelling case to show that the conservative government of the day was “captured by a group of industries and their lobbyists, known as the greenhouse mafia”. The “greenhouse mafia” acting in the interests of the fossil fuel producing and consuming sectors lobbied the Australian government to resist introducing mandatory renewable energy targets because they would undermine their economic interests. They also led to scientists in the public Commonwealth Scientific and Industrial Research Organisation (CSIRO) being gagged by the government from speaking about their research on climate change unless their comments were favourable to the federal government’s climate change denial approach. The current conservative government is worse. I mean in the end this whole thing is a question of fact, not faith, or it should be a question of fact not faith and we can discover whether the planet is warming or not by measurement. And it seems that notwithstanding the dramatic increases in man made CO2 emissions over the last decade, the world’s warming has stopped. Now admittedly we are still pretty warm by recent historical standards but there doesn’t appear to have been any appreciable warming since the late 1990s. His government upon taking office abolished the carbon and mining taxes that had only just come into force under the previous Labor government, not that their environmental credentials were anything to sing about. He also lowered the RET to become meaningless given the challenge ahead. And the conservative government de-funded the – Climate Commission – which the previous government had established to provide research and data on climate change to help frame policy responses. His government also tried to dissolve the public-sector – Clean Energy Finance Corporation – which was set up by the previous government to provide funding to renewable energy projects that struggled to get mainstream R&D funding. The Upper House (Senate) refused to allow that legislation through and the so-called ‘Green Bank’, which has been making profits on the loans it has been making to the clean energy sector survived. Plan B was put into place. Recently, in retaliation, the Prime Minister issued directives to the Corporation to stop funding small solar and wind energy projects, which in the fiscal year 2013-14 counted for around 46 per cent of the Green Bank’s investment portfolio (Source). Small-scale solar has become very popular in Australia (it is very sunny!) and undermines the coal-fired power generating sector, which makes the most profits during daylight hours. The small solar system on our roof provides free power all day and even on the rainiest, cloudiest days, the sun light is strong enough to get through and generate Kilowatts of power. We became ‘exporters’ the day we installed the panels. Many other households have followed suit. This has been accompanied by a concerted campaign by the senior ministers in the Government against wind turbines. Wind energy production is arguably the most dangerous renewable energy source for the on-going profitability of coal. After all, once the sun is down, the panels stop generating power. It can blow 24/7. Given the transparency of political donations in Australia, we know that the fossil fuel industry channels millions into various dubious ‘donor bodies’ which launder the money and donate it to the Liberal (conservative) party. These lobbies also spend a fortune on political advertising to frame the debate in their favour (Source). Let’s have no demonisation of coal … Coal is good for humanity, coal is good for prosperity, coal is an essential part of our economic future, here in Australia, and right around the world … This is a sign of hope and confidence in the future of the coal industry, it’s a great industry, we’ve had a great partnership with Japan in the coal industry … Coal is essential for the prosperity of the world … Energy is what sustains our prosperity, and coal is the world’s principal energy source and it will be for many decades to come … If you want to sustain the coal industry, if you want to sustain the jobs, if you want to sustain the towns that depend on the coal industry you have got to support the Coalition, because we support coal, we think that coal has a big future as well as a big past. Which tells anyone who knows anything that the Prime Minister and his climate-change denying government is also in denial of the structural trends in coal use around the world. Two recent things are interesting to report in this regard. First, the Australian Prime Minister has been thoroughly castigated by a British conservative and former Environment Minister, who could hardly be described as an Occupy-Leftie-Greenie-Tree-Hugger type. … the stance of Tony Abbott’s government on climate change is incomprehensible … For a country visibly and increasingly exposed to impacts of climate change, Abbott’s decision to increase climate risks by becoming the first leader in the world to abolish a carbon price mystified many. Cutting Australia’s renewable energy target was also bewildering, for a country blessed with almost unlimited renewable resources, the more so from a supposedly pro-business government. Meanwhile, the giant new coal mining and coal exporting operations on which Abbott appears to be betting Australia’s financial health look increasingly risky investments, with bank after bank refusing to back them and demand from China, the world’s biggest coal-burning nation, falling. He writes that “Abbott’s dismissal of climate science and his belief that Australia must choose between economic growth and tackling climate change speak to a distorted vision of what it means to be a conservative”. The Prime Minister has also repeatedly run the argument that Australia should hold back on any policy response to climate change and wait for the rest of the world to lead the way. He introduces spurious arguments about the competitiveness of their economy to justify his inert proposition. … like a group of soldiers lining up to attack a position and one of them saying, ‘Well, I’m going to sit this one out – you chaps carry on and good luck. The second bit of information in the last week that reflects on this issue, and is where my interest lay as an economist (which is what motivated this blog) is the latest data from the Chinese government’s – National Energy Administration – on electricity use and coal consumption in China over the last six months. The Institute for Energy Economics and Financial Analysis (IEEFA) published a story (July 16, 2015) – New China Data Shows How the Coal Export Industry Is at Risk – which summarises the latest data. 2. 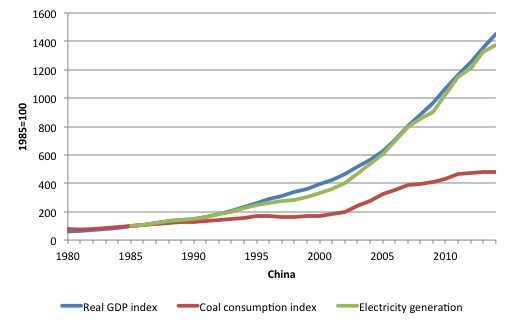 “China has decoupled its economic growth from its coal usage”. 4. “wind-farm electricity generation in China was up 29 percent year-over-year in the first six months of 2015 … Hydroelectricity production is up 12 percent year over year” and solar power use is rising. Well it puts to rest the Australian government blind faith that coal is here to stay and as the World’s second largest coal exporter we can remain smug and keep digging holes. The following graph shows the Total Coal Exports (Thousand Short Tons) for 2012 (data from the U.S. Energy Information Administration). 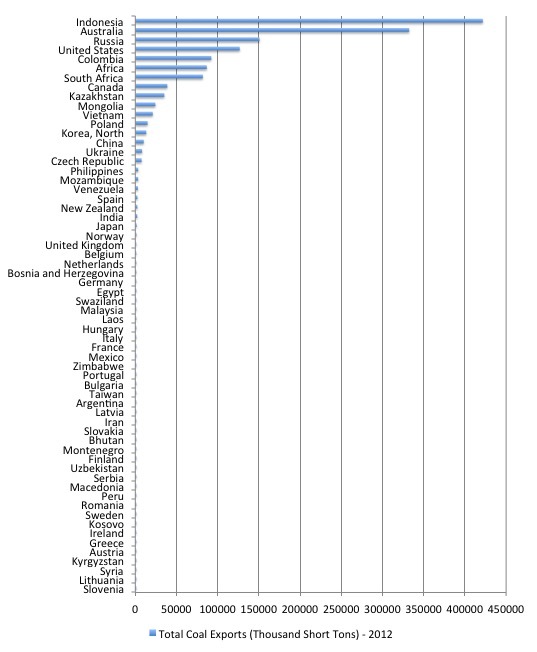 It confirms the dominant position in world coal exports for Australia. The next graph shows Total Coal Consumption (Thousand Short Tons) for 2012 and confirms China’s dominant position as a consumer of coal. Up until now, China has had to import coal (from Australia and elsewhere) to meet it voracious consumption requirements, even though it produces significant volumes of coal itself. This tells us that China is undergoing a massive structural shift in its energy mix and is doing so rapidly. Whether this reflects their technical capacity, superior insights or an authoritarian government might be an interesting question to research but the fact is that they are bailing out of coal use as fast as they can. There are several components to this shift. First, they are protecting their domestic coal industry by ensuring capacity utilisation rates in that sector are high as they wind down coal energy use. So imports are dropping. Second, they are also reducing their reliance on coal per se for energy use. So the demand for imported coal (Australia’s exports) is in structural decline. Fourth, the massive Chinese investment in Australian coal mining operations will also decline to zero in the coming years. The IEEFA Reports notes that this will immediately affect the viability of the controversial “Watermark mine”, which may not not proceed. This is manifest in the decline for electricity by “heavy industry” and the rise in demand for “office equipment, kitchen appliance, heating, ventilation and air conditioning”. The nexus between economic growth and coal usage in China has been cut. Month after month, year after year, the figures tell the same story. China is rapidly ceasing to be an importer of seaborne thermal coal … this is a sector in structural decline. And the pace of change (and decline) is much more rapid than the local coal industry would prefer and they will try to resist any further diminuition of the local consumption, which has been under threat from solar and wind. In fact, the transformation of Chinese energy use has been going on for some time. The following graph shows the relationship between real GDP, total electricity consumption and total coal consumption in China from 1980 to 2015. The electricity use data only goes back to 1985. The data source is the – BP Statistical Review of World Energy 2015 – which is a comprehensive dataset. The data in this area of research is somewhat uncertain. The official Chinese data reported above has some differences from the BP dataset, which, in turn, varies from other sources (such as the US Energy Information Administration. So it is not just a case of the Chinese misreporting their data. They might and then again they might not. The comforting part of the story is that all the datasets describe similar trends and turning points and that is the point of the blog. I indexed all the time series at 100 in 1985. The real GDP series comes from the IMF World Economic Outlook dataset. It appears that the delinking of GDP growth and coal consumption began in the 1990s and has gathered pace again in the last 5 years. There is little sign that production is become less dependent on electricity generation but it clearly has broken the nexus between output and coal use. A similar graph for Australia reveals a similar trend but only starting much later (mid-2000s). The point about the latest Chinese data is that it appears that coal consumption is now falling in China. The Chinese government has introduced major policy frameworks to reduce air pollution and increase renewable usage. Gas usage is replacing coal consumption very quickly as a result. Some years ago we did a major study for Greenpeace – A Just Transition to a Renewable Energy Economy in the Hunter Region, Australia – where we modelled the employment losses that would result from a closure of the coal-fired powered industry in the Hunter/Wyong region (which is a major supplier of electricity to NSW). We refined that research in subsequent reports (not publicly available) which reinforce the gains that the nation as a whole would make by altering the energy mix away from coal. So getting rid of the coal industry in Australia will not destroy our prosperity. But it will do wonders for the world’s natural environment. In anticipation of the dramatic structural shifts currently underway and gathering pace in China, I would urge the Australian government to take a rules-based approach to the closure of the coal industry in Australia. It should cease funding or providing any further incentives to the coal industry to research clean coal. It should introduce a sunset condition – industry closure regulation on the industry – say 2025 or 2030 – which might be overtaken by the collapse of coal exports as China shifts to domestic producers as it scales down its use. Meanwhile, the Australian government should be fast-tracking public investment in renewable base load generation capacity as a matter of priority. There will be more net jobs and the loss of export revenue in no way compromises the Federal government’s capacity to use its currency-issuing status to achieve and sustain full employment. 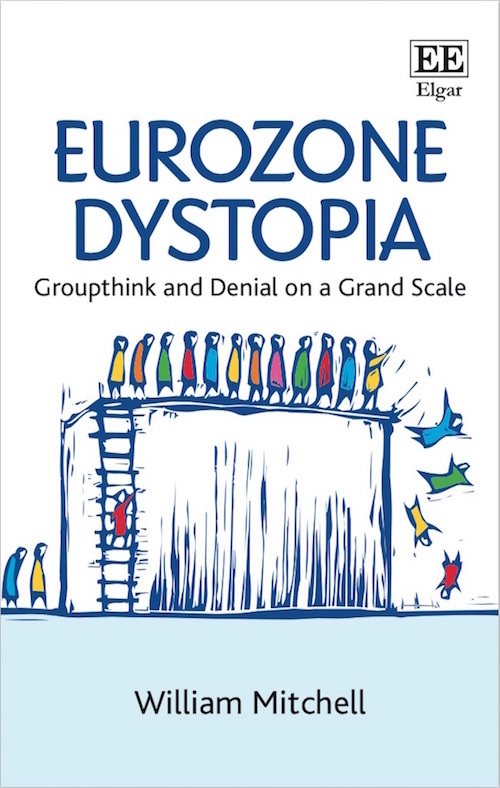 I dealt with that issue in the recent blog – Australia might join the Eurozone, apparently. 2. Real GDP growth now requires less energy but is that the point? Our Prime Minister has been thoroughly discredited by an arch conservative this week. So the criticism of the Australian government’s climate policy stance – which amounts to handing out incentives and largesse to fossil fuel producers and users – cannot be dismissed as the wild ravings of the Green left faction. The rest of the world is moving much faster on restructuring their economies. Even austerity-mired Europe is showing leadership on this issue (and not much else!). But the crunch for the carbon-intensive sectors in Australia is coming no matter how in denial our government is. China is quickly restructuring away coal consumption and coal imports and as a major buyer of our coal that means the viability of our coal exporters is now threatened. It is ironic that the ‘market’ will achieve this transition when it could be more easily managed with a progressive policy agenda. In the market shift, the forced outcomes will be ugly and more damaging than a planned transition. It is a long book (512 pages) and the full price for the hard-back edition is not cheap. The eBook version is very affordable. What’s needed aswell is less of a reliance on “green taxes” to prompt the free market in a certain direction.But instead, a Manhattan project scale of public investment in renewable /clean energy R&D and investment in public energy infrastructure to bring the cost of non-pollutive energy so low that it drives the pollutive energy industry out of business. Bill, the link to the sustainable renewable energy economy report doesn’t work. 404 error. For any rational and informed person there is no doubt that global warming is real and that coal mining is an extremely destructive activity in many different ways. Draw your own conclusions about the mental health and education of the present Australian oligarchy. The Pope’s pronouncements on the environment are welcome but he conveniently fails to make any meaningful statements on population which is one of the main drivers of environmental damage. Yet again ideology and faith trump rational,scientific thought. The present conventional wisdom (stupidity) supporting renewable energy is another example of ideology and blind faith. Solar and wind generation have niche applications but they can’t and never will supply electric grid base load. There are many reasons for this but I am not going to enter into that debate on this site. We have only one mature and advancing technology for clean and economical power generation and that is nuclear fission. That is the only practical way to remove coal from the electric equation in the time frame which is necessary to arrest greenhouse gas emissions. The coal industry know this and that is why they love renewables which will always need backup from coal fired generators. Like any non-renewable resource, the coal export industry is on dangerous ground being entirely dependent on the whims and fancies of individual nations like China and India and the global economic scene. These are hardly reliable bases for a significant Australian industry which mining for export (selling off the farm) has become. But try telling that to regressives like Abbott,Hockey et al. Hmm. Nothing to do with Thatcher’s policies then and the “natural rate” funnily increasing. WTF? Wren Lewis and Krugman are neoliberal shills. @podargus: the population issue is often used by deniers of climate change as a “well we can’t do much of substance unless that is addressed”. Sorry but I think that is nonsense and a distraction. Sure, population growth adds to the problem but there is not a linear relationship between it and emissions. It is definitely a problem if the growth in population results in the high consumption high emission lifestyle of the affluent west. Can renewables supply all our energy needs? From all that I have read, yes they can and not at some ruinous cost. But at this stage renewables are just starting to have an impact so they their is a long way to go in this country at least. Distributed generation and domestic and grid scale storage are other elements in the equation. I also dispute your assertion that coal generators love renewables. Au contraire, renewables are an irritation to them because they tend to reduce the peak prices when they used to make a motza and further penetration of renewables will only add to that trend. Climate change deniers often pretend to accept the science but then indulge in rhetorical hand waving of the kind you are engaged in. It seems that we can’t burn all the currently known reserves of fossil fuels without increasing global temperatures to dangerous levels. This implies that, if we want to stop excessive global warming, a lot of the reserves of coal, gas and oil will become worthless. Buying shares in an oil, gas or coal company may not be a good long-term investment. Yes we do need an planned transition away from coal and all fossil fuels. It’s a difficult argument to make in leftish circles but I can’t see any other viable low carbon energy source other than nuclear fission power in the foreseeable future. Beyond that, who know for sure? But, nuclear fusion would be clean cheap and virtually unlimited in its potential to deliver enough energy to power our economies worldwide. That’s not to say that the renewables can’t play their part, but the problems of energy storage would seem to be too great for them ever to be regarded as general replacement for fossil or nuclear power. There needs to be a new “Manhatten style” project to help supply the world with safe clean energy. IMO. I hope that is something we can afford! Margaret Thatcher didn’t become PM until 1979. So, much as we might like to, it doesn’t make any sense to blame her for any increase in unemployment before that date. When she became PM she won on a slogan of “Britain isn’t working”. At the time unemployment was just less than 5% using the method of counting at the time. Since then there have been numerous changes to the method, nearly all having the effect of seemingly reducing the total. Then everyone looking for a job was counted. Now they aren’t if they are too young, too old, too sick, have only been unemployed for a short time, or don’t qualify for any benefits. So I would guess that 5% then was more like 3% now, using the present method. I’d be interested to know if Bill had any more reliable measure than my guess. Previously in the 60’s unemployment had been even lower. It rarely exceeded 2%. It was possible to quit one job without worrying where the next one was coming from. So there really was full employment for anyone who wanted a job and could get themselves out of bed in the mornings to do it. My feeling is that governments were being too ambitious in trying to maintain unemployment at these ultra low levels. The blame is with them rather than the Trade Unions who will only do what TU’s do. Instead of revising the figure upwards slightly, and introducing a Job Guarantee, which is what the Govt should have done, there was a big lurch to the right. Keynesian text books were pulped and we all know what replaced them. China has only just begun to ramp up its nuclear program. By ~ 2060 they will probably have about 500 nuclear reactors in operation. Nuclear is going to end the age of coal … thank God. On the other hand a major supplier of uranium is … Australia. The only problem is that a minuscule amount of uranium goes a long way (almost infinitely far once breeders make up the bulk of the fleet), so the amount of money to be earned will never be anything remotely close to coal.